The Milwaukee M18CAG115XPD-0 is part of the ever growing range of brushless tools designed to give users 10x more motor life and up to twice as much power to grind run time. This particular model has the slimmest handle design currently in the market with the paddle switch. For safety reasons this paddle swtich is non lockable to prevent accidental start up. The 115mm keyless guard aswell as providing a brilliant cutting capacity also allows a quick guard adjustment without the need of a spanner. The removable dust screen prevents debris entering the motor therfore helping to prolong the motors life. This angle grinder is intended for grinding and cutting metal, stone and ceramic materials as well as sainding and wire brushing (the cutting guard available as an accessory must be used for cutting). The M18CAG115XPD-0 is compatible with all Milwaukee M18 Batteries (sold seperately). 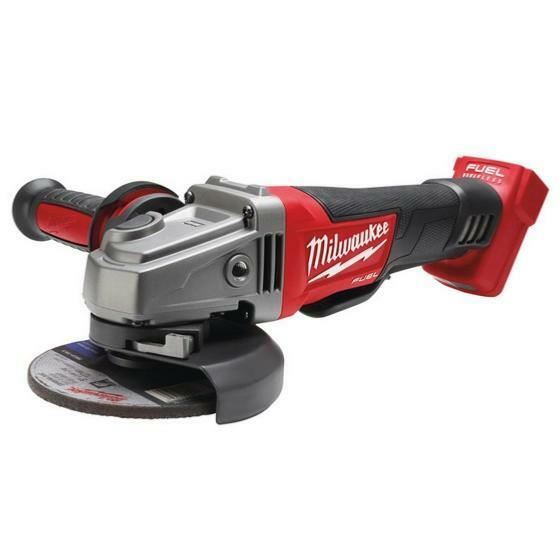 Compatible with a range of Milwaukee Accessories.Compatible with a range of Milwaukee Power Tools.